Meet the new boss, sitting next to the old boss. Nearly 70 days after Uber's CEO resigned, the startup has finally chosen a replacement: Dara Khosrowshahi, currently CEO of Expedia (EXPE). He hasn't officially accepted yet, but is expected to, according to Expedia chairman Barry Diller. If he accepts the position, Khosrowshahi will face a long list of challenges, including reforming Uber's office culture after sexual harassment allegations and curbing its steep losses enough to take the company public. But somewhere near the top of the list is the particularly thorny question of what to do with his predecessor, Travis Kalanick. The two men could not be more different, according to those who know them. Kalanick is a famously brash and combative founder; Khosrowshahi is typically described by friends as an "adult" and a "diplomat." The future of Uber may rest on them getting along. 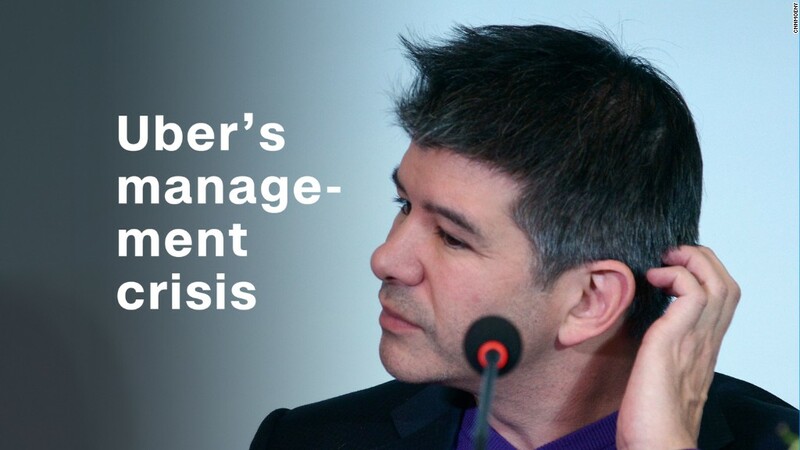 Kalanick was reluctant to forfeit his spot at the top even amid mounting PR crises. After stepping down in June, Kalanick wanted to plot his way back to being Uber CEO, according to an explosive lawsuit from one of Uber's major investors. He remains a board member and one of Uber's largest shareholders, owning about 10% of Uber's stock and 16% of Uber's voting power, according to the lawsuit from Benchmark Capital. The venture capital firm is suing Kalanick to get him off the board; other Uber investors want Benchmark to leave the board. Perhaps the closest comparison is Twitter. When Twitter (TWTR) started searching for a new CEO in 2015, it had three former CEOs still on its board. In the end, however, it chose one of them. 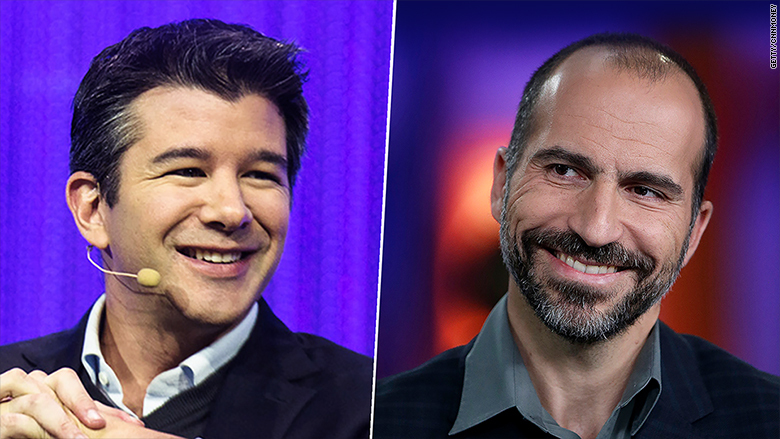 Khosrowshahi may be a new face at Uber, but there are some notable ties connecting him to Kalanick -- starting with one media mogul. One source who knows Kalanick says he is close to Diller. Kalanick reportedly set sail around Tahiti in Diller's yacht after stepping down as CEO. And Diller has worked closely with Khosrowshahi at Expedia and IAC/InterActiveCorp. Reps for Uber and IAC did not immediately respond to a request for comment. "If Dara does leave us, it will be to my great regret but also my blessing," Diller wrote in a memo to all Expedia employees on Monday. "If this is what he wants for his next adventure it will be with my best wishes." Diller isn't the only potential intermediary. Hadi and Ali Partovi, twin brothers who cofounded Code.org, also just happen to be early Uber investors and Khosrowshahi's cousins. Hadi, in particular, is close to Emil Michael, Kalanick's former right-hand man. "It will for sure be a learning curve for Travis," Hadi told CNN Tech. "I don't think it will be a learning curve [for Dara] because he's been working for Barry Diller for almost 20 years and Barry Diller is a strong personality." Hadi also said Kalanick is "delighted" about the board's choice of Khosrowshahi. "Dara has experience running an international travel company. He's the only CEO under consideration that had that experience," Hadi said. The two other top candidates were Hewlett Packard Enterprise (HPE) CEO Meg Whitman and Jeff Immelt, the former CEO of General Electric (GE). More to the point: those close to Khosrowshahi say he wouldn't accept the role unless he had assurances the board would not try to roadblock his every move. "My viewpoint is they've given him that mandate," says Woody Marshall, a partner at Technology Crossover Ventures who grew up with Khosrowshahi. As Marshall puts it, "You can't have me go into a fight with one arm tied behind my back."